Willem Dafoe, Sam Neill, Irène Jacob et al. 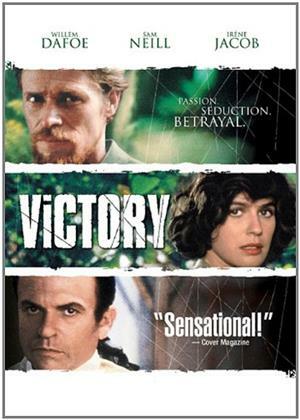 Through a business misadventure, the European Axel Heyst (Willem Dafoe) ends up living on an island in what is now Indonesia with a Chinese assistant Wang (Ho Li). Heyst visits a nearby island where a female band is playing at a hotel owned by Mr. Schomberg. Schomberg attempts to force himself sexually on one of the band members, Alma (Irène Jacob). Alma is about to be sold to Schomberg by the corrupt leader/director of the band who has enslaved the women for prostitution. She begs Heyst to help her. Having sworn off close relationships because of his past, he is challenged by her request, but agrees to help her. He escapes from the island with Alma, and they go back to his island and eventually become lovers. Schomberg seeks revenge by attempting to frame Heyst for the "murder" of a man who had died of natural causes and later by sending three desperadoes Pedro, Martin Ricardo (Rufus Sewell), and Mr. Jones (Sam Neill) to Heyst's island with a lie about treasure hidden on the island. Upon their arrival at the island, much intrigue ensues. In a climactic scene, Jones kills Pedro and then Ricardo; Alma is also shot and dies in the arms of Axel. After burning his compound and burying Alma, Axel disappears from the island but is rumored to have later been seen as a drifter in San Francisco and other ports of call. Alma's victory, in death, is having saved Axel's life in that he has again made connections with others.